When hearing “Pipeline”, you might visualize a sprawling industrial complex supporting oil refineries and distribution in your mind. The opposite of peaceful nature. In Richmond, Virginia—“Pipeline” is synonymous with access to nature—right in the middle of the city proper. Pipeline Park may have been similar to your vision of heavy industry in the era of Richmond’s tobacco industry heyday. Today, even as the namesake’s pipeline still operates, nature has taken over its meaning. 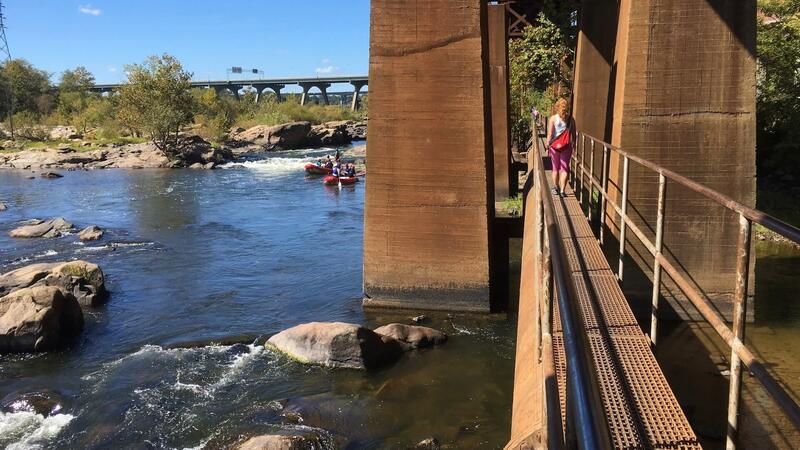 It’s one of RVA’s great outdoor activities. 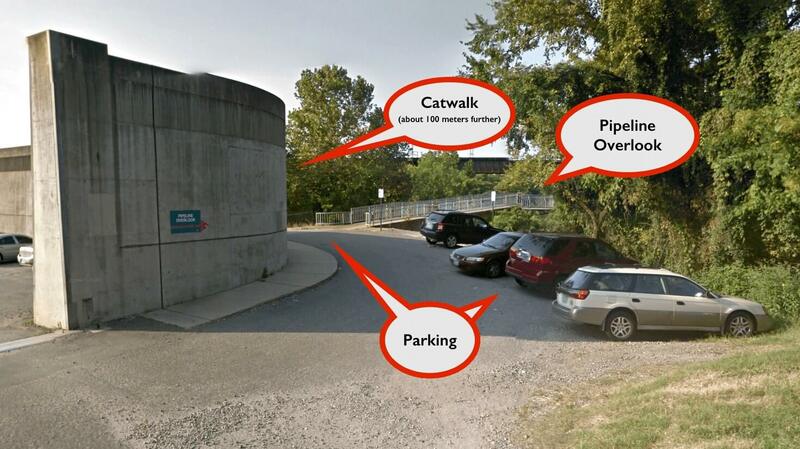 Only a short walk from downtown Richmond, Pipeline Park’s primary points of interest are Pipeline Overlook and a catwalk. Pipeline Overlook offers sweeping views from the banks of the James River atop a small concrete tower. You’ll be just a little jealous of the sights the tall riverside apartments enjoy. While the overlook does offer a nice view, and there are some hiking trails along the bank, the real gem in this park is the catwalk. The pipeline juts out from the riverbank in a straight shot west, following the river. A metal catwalk rests atop the pipeline which itself is under a railroad viaduct. The pipeline below your feet on the catwalk transfers both wastewater and sewage for the city. The viaduct above is actively used by the CSX railroad. Normally a peaceful walk, it can turn into a very different experience if you happen to catch a train running above you. The catwalk runs a hundred meters or so while straddling the pipeline before abruptly ending. At this point, the metal pipeline dons a thick concrete shell that makes for a fine walkway even as the handrails of the catwalk end. Another few hundred yards without the comfort of the catwalk and you’ll find the pipeline ends at the bank, continuing its snaking infrastructure underground. A trail along the riverbank offers a chance to continue your walk to the base of Brown’s Island when the water level is low enough. The trails and pipeline walk offer a surprising chance at observing the river’s animal life. Nature isn’t quite as dense here on the James as at Presquile National Wildlife Refuge downstream, but it’s still a lovely sampling. There’s several small islands visible from the catwalk that are wild, including Baliey’s Island and Devil’s Kitchen Island. Kayakers tend to use them as rest points. Great Blue Herons roost in the area, and you’ll catch them out hunting if you’re lucky. Osprey also frequent the area. There’s a good chance you’ll spot ducks and geese. You might happen upon beaver in the area as the churning river tends to offer them lots of debris to work with. If you’re looking to fish and have a license: smallmouth bass, channel catfish and sunfish are in the area. Rockfish can be found during the spring migration. The area is also known to have some semi-permanent human residents. Keep an eye out. The rapids that run the river length along the pipeline are very popular with kayakers and rafters. The whitewater is generally Class III although there are some Class IV sections depending on conditions. This isn’t a safe area for beginners. It’s also a great spot for a picnic, sunbathing, and swimming. There’s multiple fairly large sections of sandy beach you can hop down to from the catwalk or access from the trails past the catwalk. Richmond, and the James, are steeped in history. Only about a hundred meters east of the entry to Pipeline’s catwalk is the estimated location of a cross that was raised by Captain Christopher Newport and Captain John Smith in May of 1607. 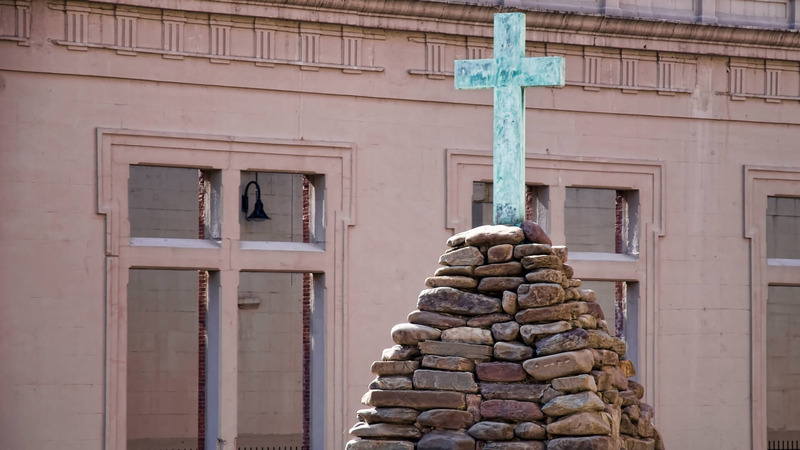 The cross was laid only days after the party’s landing in Jamestown. In the decades that followed, William Byrd, a prominent trader, operated several acres of plantation along the falls in this area. When the land passed to his heir in 1704, the Colonial government worked with William Byrd II to incorporate a town from this land. The concept of what would become Richmond began in 1705 as this land was put to use. The city was officially founded in 1737. A reproduction and monument to the Newport Cross and landing is along the nearby Canal Walk. The catwalk and Pipeline Park were opened to the public in 2005. Pipeline Park is part of the James River Park System. A small parking lot is at the entry to the park. A small bike rack is along the trail to to the catwalk. The park is open from dawn to dusk. There’s no cost to visit the park, use the catwalk, or park. Accessing the catwalk requires a short climb down a metal ladder from the riverbank. Be aware of the water level and weather. High, fast water can easily engulf the pipeline and connected trails. Attempting to map out the location might be difficult as it’s on a small access road off of S. 12th street in Richmond. Take a look at the photo below that is labeled with locations of the overlook, parking, and the direction of the catwalk. This is from the point of view of driving into the park from Shockoe Bottom/Canal. There aren’t very many “secluded” spots in a city with a metro population over a million. But, Richmond is an old city on an older river. The James River has been used for centuries by modern Americans, Colonists, and the original Native people to ferry cargo. The pipeline in Pipeline Park still ferries cargo, keeping this section of the James pristine. That pipeline also offers a clever way for us to access this beautiful, secluded park.